368 million, half of all people living in extreme poverty, reside in just five nations. But two are on track to eradicate extreme poverty by 2030. Extreme poverty cannot be eradicated without up-to-date data and informative statistics. Reports like this allow policy makers to make informative and research-backed decisions. Global Citizen campaigns for an end to extreme poverty by 2030. You can join us in the fight to end poverty here. Today, 736 million people live in extreme poverty. Half of those people, some 368 million, live in just five countries. "Piecing Together the Poverty Puzzle," a report on poverty in 2018 from the World Bank, has revealed that the five nations with the largest number of people living in extreme poverty are India, Nigeria, Democratic Republic of Congo, Ethiopia, and Bangladesh. India, which homes 170 million poor people among its 1.3 billion population, accounts for almost one-quarter of global poverty. Also in the South Asia region is Bangladesh, which accommodates 3% of the world’s poor. Nigeria, the Democratic Republic of Congo, and Ethiopia account for 12%, 7%, and 4%, respectively. All five nations record some of the highest population densities within South Asia and sub-Saharan Africa. When combined, South Asia and the sub-Saharan Africa region account for 85% of the world’s poorest people. 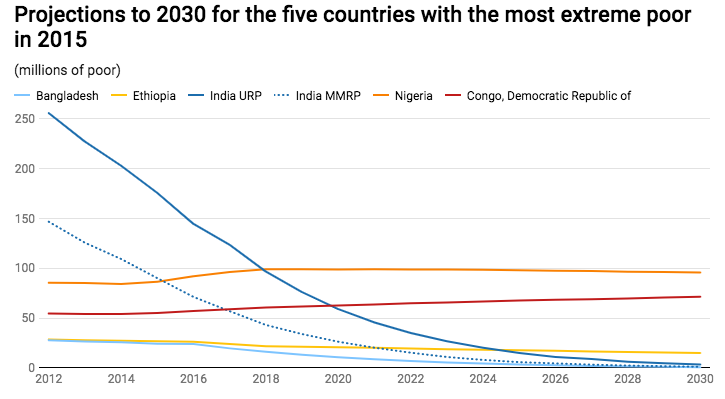 "To make significant continued progress towards the global target of reducing extreme poverty (those living on less than $1.90 a day) to less than 3% by 2030, large reductions in poverty in these five countries will be crucial," World Bank data scientists Roy Katayama and Divyanshi Wadhwa wrote for the World Bank Data Blog. World Bank 'Piecing Together The Poverty Puzzle' report. When it comes to nations with the highest percentage of the population living under the poverty line, Syria takes the top spot at 82.5%, according to country statistic organisation IndexMundi. South America's Suriname (70%), Central America's Guatemala (59.3%), and the Caribbean island Haiti (58.5%) rank alongside various African nations in the top 20 list. Global poverty rates have dramatically decreased over recent decades. In 1990, more than one-third of the global population lived in extreme poverty. In 2015, that percentage was reduced to one-tenth. Despite such improvements, World Bank President Jim Yong Kim stressed the importance of not taking success for granted. "In many countries, the bottom 40% of the population is getting left behind; in some countries, the living standard of the poorest 40% is actually declining," Kim stated in the report. "We should go beyond the focus on reducing the global poverty rate to below 3% and strive to ensure that all countries and all people can share in the benefits of economic development."